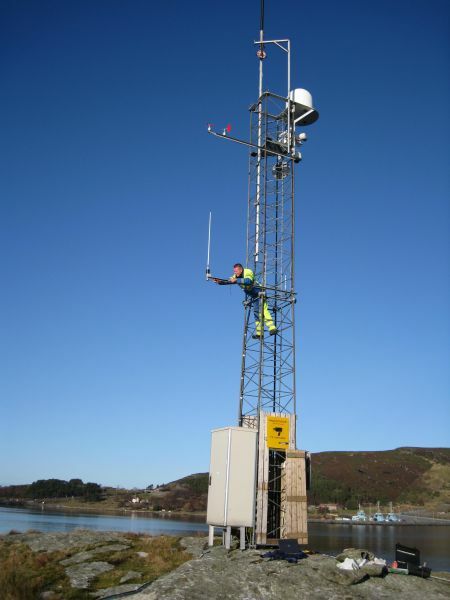 A standard Aanderaa Weather Station(WS) is installed on an island close to the port on an existing mast structure. Here wind speed and wind gust in addition to wind direction is measured. An Aanderaa RDCP 600 Sea Current Profiler is installed on the sea bottom at 27 meter depth. This unit is configured to measure sea current speed and direction at the sea surface and at 6 meter depth. An underwater cable connects to the WS cabinet. 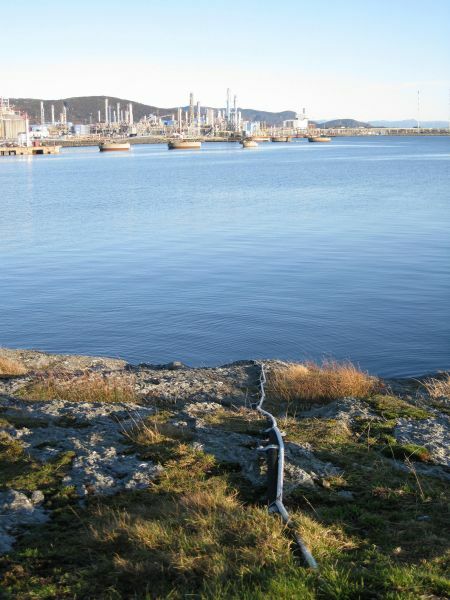 The combined data from WS and RDCP is communicated via GPRS to the Norwegian Coastal Administration data server. Ref. drawings S-6831 and S-6830. The picture below shows how the data is presented on the WEB in the Harbour Masters Office. Live data is available here. These data are also available via the Automatic Identification System (AIS) - an automatic tracking system used on ships and by Vessel traffic services (VTS). The AIS interface is installed in the WS-cabinet. Hereby the ship crew and the harbor master can discuss the strategy for docking based on real time data. The system has been in operation since early 2009 and will be upgraded in 2013. Aanderaa have made installations in ports, harbours and sailing fairways all over the world from arctic to tropical climates. This is just one example. If you are intrested in our marine transport harbour monitoring systems please contact us at aanderaa.info@xyleminc.com or tel: +47 55 60 48 00. The system delivered is a Real-Time Monitoring System containing sensors and data collecting platforms for meteorological and oceanographic parameters. The delivered system consists of meteorological and hydrological sensors and data logging equipment for measuring parameters that are of importance for operations in the harbour. 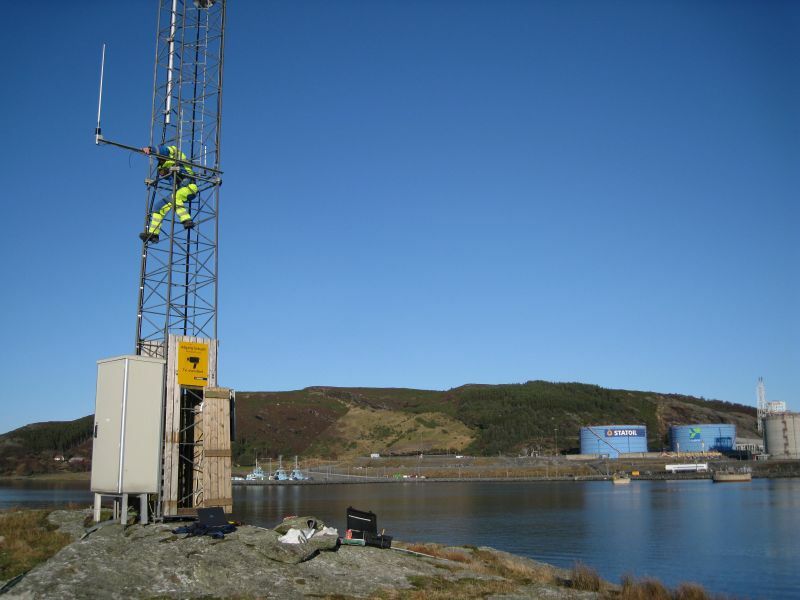 This delivered system consists of meteorological and hydrologic sensors and data logging equipment for measuring parameters that are of importance for operations in the harbour. The system delivered is a Real-Time Monitoring System containing sensors and data collecting platforms for oceanographic parameters. Aanderaa GeoView is a web based display solution for environmental data display.